The 2016 Gretsch Renown hits its target market bang-on. An absolute triumph. Some may prefer an undrilled bass drum. The ‘pro’ level acoustic kit market is a tough battleground, with a target audience made up of savvy players who have a solid idea of what they like (or don’t), have probably developed a sense of brand loyalty, and in some cases aren’t afraid to buy used gear. Gigging drummers who want great sounds, features and finishes for a street price of between a grand and £1,500 are spoilt for choice with production kits from big names such as DW, Tama, Mapex, Pearl and a whole lot more. Another titan that does battle in this arena is Gretsch, whose Renown series has been a staple for jobbing drummers since its introduction in the early noughties. The Renown has undergone multiple revisions since then, and at the start of 2016 Gretsch unveiled the latest update to this perennial of the live scene. As with many NAMM announcements, these things take time to filter through to the shelves of our local drum stores, but the Renown 2016 has finally arrived, complete with a reduction in price compared to the previous model. Gretsch last updated the Renown in 2013, adding the GTS suspension mounts and changing from the ‘stop sign’ badges to the more vintage-styled and much coveted ‘Round Badge’. So what’s new here? Well, Renown kits have always featured Gretsch hallmarks such as the Formula shells, 30° bearing edges and the silver sealer interior. While these remain, the big news is the replacement of die-cast rims with Gretsch 302 hoops. These double-flanged hoops are found on the Broadkaster and Brooklyn sets, the idea being that the reduced mass allows for greater resonance than a die-cast hoop, whilst maintaining the focused tone. All good so far, but what may not be so quickly apparent at first glance is the fact that Gretsch has also reverted to using a drilled bass drum and post to mount the rack toms. Renown kits have always featured Gretsch hallmarks such as the Formula shells, 30° bearing edges and the silver sealer interior. While these remain, the big news is the replacement of die-cast rims with Gretsch 302 hoops. The Renown is available in four different familiar jazz, fusion, euro or rock configurations, each with or without a 14"x5.5" or 14"x6.5" snare. The rack toms are 10"x7", 12"x8" and 13"x9", floor toms are either 14"x14", 16"x14", or 16"x16", and there are three bass drums: 18"x14", 20"x16", 22"x18" and 24"x14". Meanwhile, Gretsch offers an additional 8"x7" tom, 18"x16" floor tom and 14"x5" snare drum outside of these configurations. On top of this, there are four lacquer finishes and three wrapped finishes available to choose from (Cherry Burst, Gloss Natural, Piano Black, Satin Tobacco Burst, Silver Oyster Pearl, Vintage Pearl and Blue Metal). Our review kit is in the Euro set-up (22", 10", 12", 16") with a 14"x51⁄2" snare, and comes in the expensive-looking Cherry Burst gloss-lacquered finish. There are a few realisations when taking our Renown out of its boxes. The first is the visuals: it’s flawless. The deep, rich Cherry Burst looks like it could be on a kit costing twice as much, and the topcoat has been buffed to a glassy-smooth finish. Next up is the hardware: nothing here feels ‘off-the-peg’. From the tapered T-wing thumbscrews to the Gretsch ‘G’ cast into the memory locks, it feels like these parts are made for your kit, rather than sourced, which is rare for what is an eastern-made entry-point into the upper end of a company’s line-up. Finally, there’s the inclusion of decent heads. 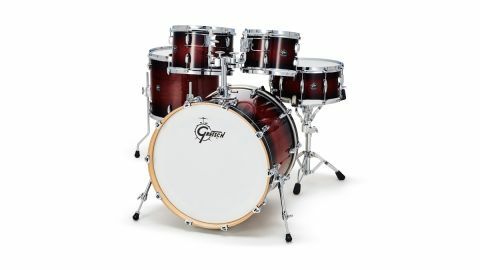 The argument against this has long been that every drummer uses different heads, so there’s no point in adding to the price tag with expensive - yet still not necessarily suitable - heads, but we’re glad to see that Gretsch has included a clear Remo P3 (bass drum), clear Emperors (toms) and a coated Ambassador on the snare drum. After fitting the heads and lugs, we’re ready to roll, and we start in earnest with the toms. The rack toms are a five-lug design, making tuning nice and fast, but it’s also down to the combination of lugs, hoops and heads that make the Renown a doddle to play. We quickly took our toms from a controlled thick rock sound with just a little tension on the batters (arguably the Emperor’s wheelhouse or tone and feel) to a singing, ring-free clarity at medium tension with the reso and batter in unison. Higher tunings worked well without choking out too, although this is where single-ply heads will most likely make the difference. The floor tom follows suit with a controlled beefy thud at lower tunings, and clarity when pitched up. So that’s a tick for the 302 hoops! Prior to playing, the bass drum was the part of the kit that intrigued us the most. Undrilled bass drums used to be the preserve of high-end kits, and have become very popular in recent years for a few reasons. This bass drum sounds huge. With an un-ported reso head and the P3, we didn’t find any need for any extra muffling. First is the argument that cutting a hole in the shell and mounting a post in it can reduce the resonance of the drum. Second, many prefer the flexibility they give for mounting toms over a fixed post. Third (and one we’ve been guilty of) is the visual aspect: undrilled bass drums look cool. So, it was a surprise to see that Gretsch has opted to go back to mounting the toms from the bass drum, making (at the time of writing) the Brooklyn the most affordable way to get an undrilled bass drum in the Gretsch line-up. However, it really doesn’t matter, because this bass drum sounds huge. With an un-ported reso head and the P3, we didn’t find any need for any extra muffling. Tuned low, it’s gutsy and sustained, while adding some tension reveals more of a funky punch, and we didn’t have any problems positioning the toms in a comfortable way. Finally, let’s talk about the snare. It’s a straightforward 14"x5.5" maple drum: great for the everyman nature of the kit, if not the most personality-fuelled drum. The most impressive part of the snare was the controlled nature of its sound. Tune it dead, thick and clear without annoying buzzes. Tune it with some ring, and you get a clean overtone. It’s adaptable and will work in multiple styles, and if you don’t own a decent wooden snare already, is well worth considering. Of all the mainstream brands out there, it’s fair to say that Gretsch is currently very much ‘in’ in terms of trends, without leaning heavily towards any one particular type of player, and we’d say that’s also true of the Renown. Take a cross-section of the Gretsch artist roster: session aces like Ash Soan and Karl Brazil, technical titans like Vinnie Colaiuta, rock legends Taylor Hawkins and Charlie Watts, or contemporary tastemakers like Mark Guiliana and Mike Johnston, roll it into one and that sums up the Renown perfectly. It’s a great combination of Gretsch’s heritage vibe, mixed with modern functionality.